The program will feature numbers from the Terry Gibbs Dream Band and arrangements for Milt Jackson by John Clayton showcasing Jay Lawrence on vibes along with Katrina Cannon’s exceptional numbers with charts arranged by Geoffrey Keezer, Gordon Goodwin and John Clayton. 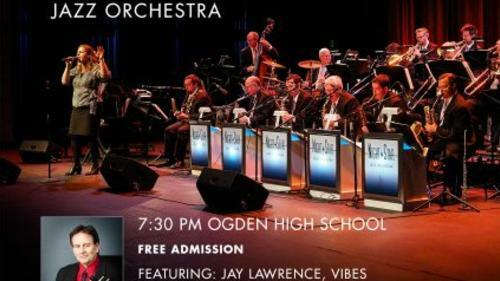 The Night Star Jazz Orchestra will be performing wide range of music from ballads to burnin’ swing numbers for an evening celebrating jazz and arts education with members of the Ogden High School jazz band.Admission to the event is free of charge. As part of the evening, we’ll be hosting a fundraiser for those that wish to participate to help Ogden High School Director of Bands, Stan Renda raise funds towards the purchase of a new professional marimba, which can cost upwards of $15,000, for his blossoming percussion and jazz education program. 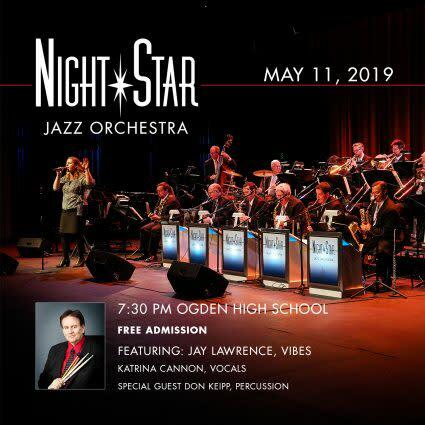 Donations toward the purchase of the new marimba can be made directly to the school at the door or prior by contacting Mr. Renda at rendas@ogdensd.org.The Night Star Jazz Orchestra presents the Jazz Arts Celebration in conjunction with Jazz At the Station as part of a day of jazz arts education with multiple events happening in Ogden on May 11th. Earlier in the day a jazz education festival will be taking place from 1 pm to 6 pm with multiple school ensembles at the Ogden Amphitheater culminating with the evening show at the Ogden High School Auditorium featuring the Night Star Jazz Orchestra and special guests. Also happening in Ogden and throughout Northern Utah that weekend, is the “Spike 150” celebration the 150-year anniversary of the Golden Spike ceremony in Utah, commemorating the completion of the transcontinental railroad in America 150 years ago. A day of jazz is a perfect companion to the events happening throughout Ogden to celebrate the connection of East and West with America’s unique gift to the world that is the art of jazz.The venue for the concert is Ogden High School’s crown jewel auditorium, originally built as part of the WPA program in the 1930’s. The Art Deco school building is a true landmark of Ogden and was restored as part of a community effort to save the building.